Related Fluid Power, a leading designer and manufacturer of hydraulic manifold control valves and power units, has installed a MecWash Midi at its production plant in Fife to ensure its manifolds and component parts meet the highest levels of cleanliness demanded by today’s hydraulic systems. Established in 1974, Related Fluid Power provides standard and customised solutions to OEMs worldwide; the MecWash Midi will ensure it continues to meet and surpass the stringent cleanliness and ‘wash down’ standards set by many global OEMs. 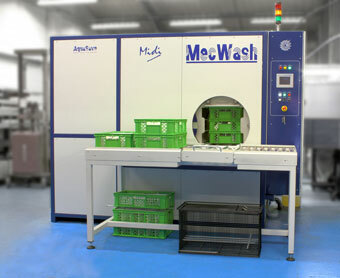 The MecWash Midi is designed to process complex and intricate machined or pressed parts that require very high standards of cleanliness, surface finish and dryness, including the removal of all types of contamination from soluble and mineral oils to greases, polishing compounds, lapping pastes and dye penetrants. The Midi can combine ultrasonics with high flow flood & spray washing, rinsing, dedicated jetting (which targets critical holes or galleries and rotates with the components) and vacuum drying to provide the highest quality aqueous component cleaning and drying available. All features can be custom programmed to optimise cleanliness and efficiency, and ensure consistency in the cleaning and drying processes. The MecWash Midi ensures Related Fluid Power continues to provide their customers with the highest cleanliness standards. Related Fluid Power’s Midi is complimented by an Aqua-Save waste water recycling system which cleans the washing solution for re-use – reducing water usage and helping Related Fluid Power to meet its environmental aims and responsibilities. Find out more about MecWash's Midi and Maxi range here.